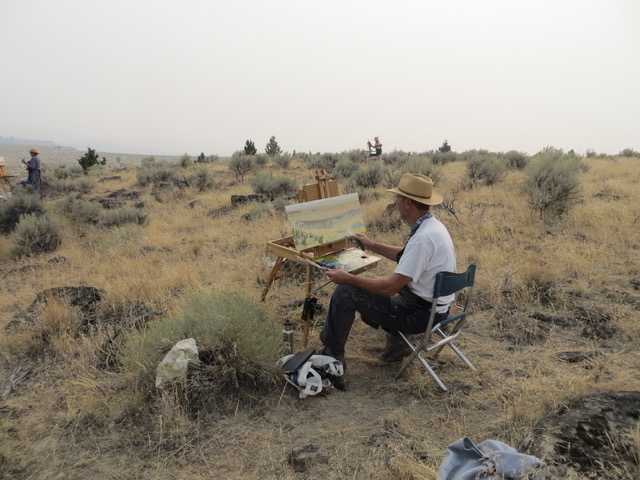 In this four-day workshop we’ll explore on-site landscape painting in the heart of Oregon's stunningly beautiful sagebrush desert. The workshop will focus on creating the feeling of big desert space through the development of subtle color relationships and abstraction of the observed physical forms – buttes, valleys, plains and sky. Depending on the needs of each painter, we may delve more deeply into purposeful distortion of the seen forms of land and sky. The painting group will work out of Diamond in Harney County. Lodging and meals – scrumptious meals - at the Hotel Diamond. The long days of August allow us a wide range of the desert sites. I’m told that August has not been as hot there lately. Students and me painting on the Diamond Grade on a smoky day in August.